The Association has been active in identifying sites where Allen products have been preserved and acting upon information provided from enthusiast reporting potential sites. In some instances, where commercial requirements have necessitated the demolition of sites, the Association have worked with the owners to secure the donation of W H Allen equipment (Or sometimes equipment manufactured by companies within the same commercial group as W H Allen) of special historical interest, to a museum site. The Allen Heritage Award was introduced in September 2007 with the objective of recognising items or displays that are of exceptional value to Allen product heritage. The Award is an endorsement by the Association to owners and promoters of Allen Heritage in recognition of their commitment. There are several other high quality sites which have not yet attained the exacting criteria for an Award, but nevertheless well worthy of a visit. These are categorised as ‘Sites of Special Interest’. The Museum of Fenland Drainage – Prickwillow Engine Trust. A brief summary of each site is given below. The museum is on the A487 Cardigan to Aberystwyth road, 8 miles north of Cardigan just beyond the village of Tanygroes. (November 11). It was established in 2003 by Paul and Hazel Evans, moving their large collection of engines there from the Isle of Man. They work hard with their fellow trustees and volunteers to collect classic engineering icons built during this era. Through their collection of diesel engines, including several produced by W H Allen, the museum has captured this historic era of engineering development and innovation. Some exhibits have been donated by collectors and others ‘rescued’ as they come to the end of their service life to be replaced by modern technology. The majority are carefully rebuilt as working exhibits, as close to their original presentation as possible. (January 2012). Power equipment is run most days during the season, and there are special ‘crank-up’ days which are always well attended – See the museum website for details of activities and Allen engines displayed. Heritage Award will be presented on 31 August 2014. An excellent museum with many exhibits and holds regular steam days. Included in the exhibits is an Allen single-cylinder, vertical, fully-enclosed high-speed steam engine dated 1917 restored to working order by The Waterworks Museum. Inaugural start on Sunday 26th July 13 by Mayor and Mayoress of Hereford. This example was installed on a British Admiralty Patrol Boat. In 1939 it was removed from the boat and converted for use as a land-based standing engine. Discovered on a farm at Upton Bishop in January, 2008. Power: 20bhp Speed: 550rpm Working pressure: 170psi (11 atmospheres). This site is well worth a visit but there are no Allen diesels on display although a model of an Allen 5012 engine entablature is displayed as representative of the last Allen engines produced which were built at Crossley Works. The museum has in store several engines of other manufacturers in preparation for building additional engine halls on site. These include an Allen single cylinder air blast engine (ex Jordans Mill) which requires restoration. (November 11). The museum was able to rescue and preserve the Crossley diesel from St Germans Fen pumping station (Near Kings Lynn) before it was demolished to make way for a new station with greater pumping capacity. Photos and a video of its last run at St Germans Fen were taken by the Association. This Victorian mill site is alongside the River Ivel. It has been restored by the Jordan family to show off its interesting history. Only a 3S30 remains from the multi-engine room (now demolished) as part of the restoration of Holme Mills to a heritage museum (Opened to the public Easter 2013). The engine belt drove the milling machinery when the flow in the river Ivel was insufficient. It is dry sump and has been moved a few feet from its operational site towards the end wall of the mill to form a static exhibition. Previously there were other Allen engines on site, now removed to other museums. (October 2013). The site surrounding the diesel engine has yet to be developed with plans to house it in a glass walled room and show its historical importance to previous mill operations. A most interesting railway to visit for the enthusiasts and a good family day out. With technical support from the Association they have preserved Allen 6SR27, 150 hp (nominal) at 550rpm driving an AEI Traction Generator. This loco is known as Ford No 1 from its days as a shunter at Ford Dagenham works. (December 2011). Previously the Kew Bridge Steam Museum which was upgraded in 2013 and re-opened in 2014 as the London Museum of Steam & Water. One 3S47 (K1/43445 B) Allen Diesel driving a Gwynne conqueror pump is on display. The design is similar to the larger Western pumping station engines, with a three cylinder, 4-stroke engine, coupled to a centrifugal pump. It has many features in common with more modern diesel engines, including a fully enclosed crankcase, but still has an external flywheel (like earlier steam engines) and open valve gear. This is one of four engine sets ordered by the Metropolitan Water Board and originally installed at Kew Bridge to meet extra demand during the summer months and, along with electrical pumps, to replace the steam engines when they were retired during the 1940’s. Manufactured in 1934, it was last worked in 1985 and taken into museum ownership in 1986. This was a commercially owned and operated site. Pumping station opened in 1929 and year of manufacture of WHA equipment. Remaining is a 6cyl (Probably A44 K1/13316) Air Blast Injection Allen Diesel driving a WHA generator (I/13351/2). Supported by the Association, Internal Fire museum has liaised with the Water Board and the engine is now at the Museum (May 2018). This is a commercially owned and managed site. A former weaving mill with boiler room containing an Allen Steam Turbine and Allen Gearbox (genset) with control and instrument panel, Allen 4T47 Diesel Engine coupled to a DC Allen generator, Gwynnes pump and Allen Switchboard with Voltage Regulator that is now part of a housing re-development site having listed buildings in which there is increasing interest to preserve the machinery space. English Heritage is aware of this site. Power house requires restoration. Note: Tonedale Mill (Ex Fox Bros) is a development site with no dedicated website address at the moment. (November 2011). This is a private site owned by developers. English Heritage are working with them to secure preservation of the powerhouse and the Association has offered to work with them should it be possible to restore the site. It is unlikely there could be working exhibits and steam would not be available and the copper work has been removed. This is a commercially operational site which is occasionally open to the public. Still working are 3 6S47’s (Originally 4 Installed in 1934) driving Conqueror Size SE76 pumps. Also 1 6S12D in an acoustic enclosure. In which the Association has worked to facilitate the preservation of some equipment of special historical interest. 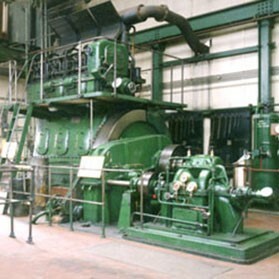 The Crossley Engines and Allen-Gwynne Pumps have been replaced, but one engine has been recovered and moved to The Internal Fire Museum of Power, Tanygroes, Wales. Now demolished but the heritage committee were able to see the Crossley diesel removed for preservation by the Anson Museum, Poynton, Stockport and ensure that the site was fully documented (photographs and videos) before being decommissioned. The Allen equipment (Allen 6S37 engines and Allen Pumps) has now been replaced and the heritage committee assisted in the removal of one engine for preservation by the Internal Fire Museum of Power.